Background Diarrhoea is the second most common cause of death in children under 5 years of age in Kenya. It is usually treated with oral rehydration, zinc and continued feeding. Racecadotril has been in use for over 2 decades; however, there is a paucity of data regarding its efficacy from Africa. Objectives The objectives of this study were: to compare the number of stools in the first 48 hours in children with severe gastroenteritis requiring admission and treated with either racecadotril or placebo, to study the impact of racecadotril on duration of inpatient stay as well as duration of diarrhoea and to describe the side effect profile of racecadotril. Methods This was a randomised, double-blinded, placebo-controlled trial. It enrolled children between the age of 3 and 60 months who were admitted with severe acute gastroenteritis. They received either racecadotril or placebo in addition to oral rehydration solution (ORS) and zinc and were followed up daily. Results 120 children were enrolled into the study. There were no differences in the demographics or outcomes between the 2 groups. Stools at 48 hours: median (IQR) of 5 (3–7) and 5 (2.5–7.5), respectively; p=0.63. The duration of inpatient stay: median (IQR): 4 days (1.5–6.5) and 4.5 (1.8–6.3); p=0.71. The duration of illness: 3 days (2–4) and 2 days (1–3); p=0.77. The relative risk of a severe adverse event was 3-fold higher in the drug group but was not statistically significant (95% CI 0.63 to 14.7); p=0.16. Conclusions Racecadotril has no impact on the number of stools at 48 hours, the duration of hospital stay or the duration of diarrhoea in children admitted with severe gastroenteritis and managed with ORS and zinc. Trial registration number PACTR201403000694398; Pre-results. ▸ Current treatment of acute gastroenteritis as recommended by the WHO includes the use of oral rehydration solution and zinc. ▸ Studies carried out on racecadotril in children have proved its efficacy in reducing duration and severity of diarrhoea. ▸ The European Society of Paediatric Gastroenterology, Hepatology and Nutrition has stated that racecadotril may be used in the management of acute gastroenteritis in children. ▸ Racecadotril did not significantly impact the duration or severity of diarrhoeal disease in children with severe gastroenteritis. ▸ One of the first studies using racecadotril to treat children in East Africa. ▸ Defining which populations of children with acute gastroenteritis would have a maximum benefit from racecadotril. This could allow recommendations on its use to be refined. This study was carried out to bridge gaps in knowledge about the use of racecadotril and its usefulness when used with zinc in African children with severe gastroenteritis. This was a prospective randomised, double-blind, placebo-controlled, parallel-group study conducted at the Kenyatta National Hospital. This is a tertiary level, national referral hospital and has four dedicated paediatric wards. Participants were assigned to the control arm or treatment arm with a 1:1 ratio. Exclusions were: children who had severe vomiting (scoring 3 on the Vesikari score for maximum number of vomiting episodes per day); those with a clinical diagnosis of dysentery or a known diagnosis of liver or renal failure; children who had prescriptions of probiotics or any other antidiarrhoeal medication (loperamide, attapulgite, activated charcoal, diphenoxylate and kaolin). All children were admitted and started on WHO recommended treatment by the attending physician. They received either intravenous fluids as per WHO plan C (30 mL/kg followed by 70 mL/kg over 1 and 5 hours, respectively, in infants and over 30 min and 2.5 hours for those over 12 months of age) or low osmolality ORS as per WHO plan B (75 mL/kg over 4 hours). Zinc was prescribed at 10–20 mg/day. Participants were recruited within 24 hours of admission after initial hydration had been completed. Eligibility was determined by calculating the Vesikari score based on the information recorded by the primary physician in the patients' chart. This included the patients' history up to and the examination at the time of admission. A computer program was used to generate random numbers in blocks with varying sizes. These were used to assign patients randomly to either the test or control arm of the study. Both the drug and placebo were supplied by the manufacturer, Racedot—Macleods (India) and distributed by Sai Pharmaceuticals (Kenya). These were packed in tamper proof brown bags, sealed and labelled by a study pharmacist based off site. The test arm received racecadotril at a dose recommended by the manufacturer: 10 mg per dose for children below 12 months of age and 30 mg for those over 12 months of age. This was administered as granules dissolved in 10 mL of water and taken three times a day for a maximum duration of 3 days. The control arm had a placebo preparation administered in the same way. An initial dose of the drug or placebo was given at the time of enrolment. The parents were taught how to administer the drug at this time and this was confirmed by return demonstration. The participants were followed up using daily interviews asking about: the number of stools, the consistency using a Bristol stool chart,14 the presence of blood in stool, any new symptoms and the introduction of an antidiarrhoeal or other medication. Treatment was given either until the stools were formed or for a total of 3 days, whichever came first. Children who were discharged before complete resolution of symptoms were followed up by phone interviews until recovery. The primary outcome measure was the number of stools in the first 48 hours after introduction of the drug. The secondary outcomes included the duration of inpatient stay, the duration of illness and the number of adverse events associated with racecadotril. Estimation of sample size was carried out using the formula for comparison of two sample means. The study was powered at 90% with a significance level of 95%. Assumptions for the formula were based on the study by Cojocaru et al8 using his outcome of total number of stools at 48 hours. A provision of 10% was made for attrition and a final sample size of 60 participants in each arm was derived. The attached online supplementary file contains the complete sample size calculation and references. Baseline data for the two groups were collected and analysed by comparing proportions to determine the presence of any significant differences. Once the data were collected and analysed, it was noted to be positively skewed. Medians with IQRs were calculated for the outcome measures and the two groups were compared using the Mann-Whitney U test according to intention-to-treat analysis. STATA V.11.0 software was used for the above. A total of 154 children with severe gastroenteritis were screened for the study during the data collection period from 3 February to 26 March 2014. The details of recruitment and allocation are shown in figure 3. Analysis included all 60 participants in each group. Three participants from the drug group and two from the placebo group that did not complete the protocol were included in the analysis. All results for the outcome measures (except adverse events) are given as medians with IQRs. Flow diagram showing progress through phases of the trial. The final participants analysed are on ITT and PPA basis. ITT, intention to treat; PPA, per protocol analysis. There was a statistically significant predominance of girls in the drug group (p=0.04) despite an overall male prevalence in the study. This difference was believed to arise due to chance as randomisation was carried out according to protocol. The difference in dehydration levels between the groups was not statistically significant (p=0.25). It was noted that most children in the study were mild to moderately dehydrated with severe dehydration present in only 15% of the drug group and 27% of the placebo group. This finding was attributed to use of the Vesikari score as an inclusion criteria. Similar results were found in the study carried out by Schnadower et al.16 Baseline data are summarised in table 1. The difference in the median number of stools on intention-to-treat analysis revealed no statistically significant difference. Median (IQR) 53–7 stools for the drug and 5 (2.5–7.5) for the placebo (p=0.63). This was measured as the number of days from the start of the medication to the day of discharge as determined by the attending physician. The duration was shorter in children in the drug group: median (IQR) of 4 (1.5–6) days as compared with placebo: 4.5 (1.8–6.3) days. The results were not statistically significant (p=0.71). This was defined as the duration from the time of introduction of the drug to the appearance of ≤3 formed stools in 24 hours. This was noted to be lower in the placebo group: median (IQR) of 21–3 days and 3 (2.5–3.5) days for the drug. The results were not statistically significant (p=0.77). The proportion of patients experiencing any adverse event was similar for the two groups (23%). There were four mortalities overall, two in each group. Convulsions were noted in three children who were on the drug (5%) but none in children on the placebo. All three children were investigated for concurrent meningitis and this diagnosis was confirmed in one. Overall, the proportions of children who had serious adverse reactions were higher in the racecadotril group, although this was not statistically significant: relative risk 3.0 (CI 0.63 to 14.27); p=0.16. Non-serious adverse events: relative risk 0.81 (CI 0.36 to 1.83); p=0.62. The adverse events are listed in table 2. Analysis of the data using means and SD, with comparison using the Student’s t-test, was also carried out. The results showed no significant difference. Linear regression analysis revealed malnutrition was a significant factor for duration of in-hospital stay. This analysis is presented in the online supplementary file. The Vesikari score made up part of the inclusion criteria for our study, thus ensuring all children recruited had severe gastroenteritis. This is a composite score that was originally developed by Ruuska and Vesikari.12 ,13 It incorporates the patient's temperature, level of dehydration, need for hospitalisation as well as the duration and frequency of vomiting and diarrhoea. Although the Vesikari score was originally used to determine severity of gastroenteritis at the conclusion of illness, it was shown by Schnadower et al to be useful for grading episodes at the point of first contact and during follow-up. They recommended its use in clinical trials involving acute gastroenteritis disease.16 This recommendation was later endorsed by the European Society of Pediatric Gastroenterology, Hepatology and Nutrition (ESPGHAN) in their 2014 update on the guidelines for management of acute gastroenteritis in children.21 To the best of our knowledge, the incorporation of the Vesikari score in the inclusion criteria has never been performed before in any studies on racecadotril and this may have led to the lack of effect seen with the medication in this study. In their review carried out in 2011, Lehert et al7 alluded to the same noting that baseline level of dehydration was a significant negative predictor for duration of diarrhoea after introduction of racecadotril. Another difference in the population studied was the inclusion of children with malnutrition. In a trial carried out by Jean et al,19 children with weight for age <80% were excluded. In this study, children with severe undernutrition made up 15% of the drug group and 26% of the placebo group. However, the mean weight of participants in this study was 7.4 kg which was similar to a study carried out by Savitha20 (as quoted in the Lehert et al's7 review). In both the Jean et al and Savitha studies, there was a significant improvement in the stool output for children on racecadotril. Clinically significant adverse events were equally distributed between the two groups. The results are similar to those in other studies including the review carried out by Lehert et al.7 Adverse events in this study involved mainly the skin and upper respiratory tract (13%), which are comparable to those found in the literature.6 ,7 Convulsions were noted in the drug group of this study, a finding that has not been reported in studies with racecadotril thus far. The significance of this finding cannot be commented on due to the sample size. Although the number of stools was recorded on a daily basis, measurement of stool weights may have been a better measure to determine stool output as has been done in similar studies on the subject. The recording of number of stools as reported by the parents/guardians may have introduced a recall bias that affected the results. This may have been avoided by investigators observing the number of stools rather than parents providing information. The presence of comorbid conditions was not considered when the participants were recruited to the trial. Some of these conditions (especially HIV) may have had an impact on the results. 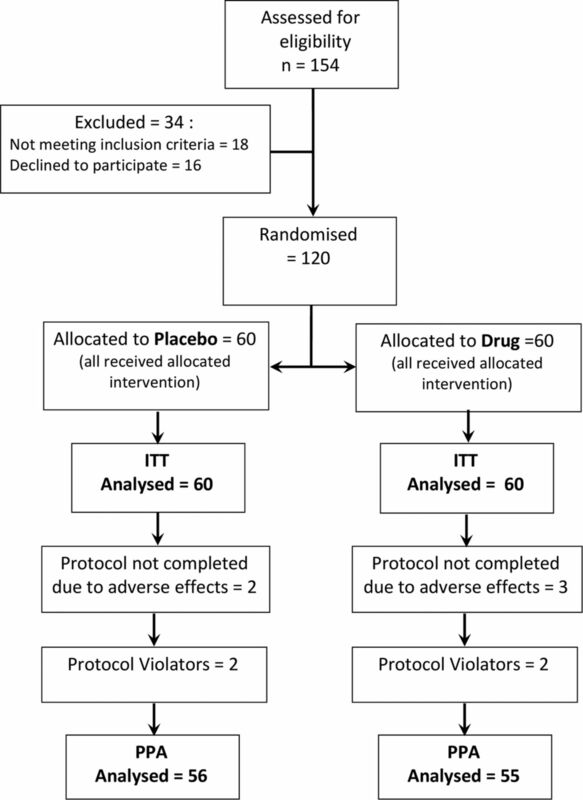 This study does not demonstrate a significant reduction in the number of stools at 48 hours for children admitted with severe gastroenteritis after introduction of racecadotril. Furthermore, it does not reduce the duration of inpatient stay or the duration of diarrhoea when compared with placebo. The authors thank the Aga Khan University Hospital Nairobi—financial and logistical support to carry out the study; University of Nairobi, Kenyatta National Hospital—permission to use facility as study site; Sai Pharmaceuticals, Nairobi, Kenya—provision of drug (Racedot) and placebo for the trial. The authors also thank research assistants: Gurpreet Rooprai, Benjamin Matei and Shimona Menezes; and Drug Safety Monitoring Board: Dalton Wamalwa, Bonface Osano, Peter Ngwatu and Hussein Dossajee.
. Global burden of disease estimates. Geneva: World Health Organisation, 2007.
. Epidemiology of waterborne diarrheal diseases among children aged 6–36 months old in Busia—Western Kenya. Int Sci Index 2010;4:1001–8.
. Role of antidiarrhoeal drugs as adjunctive therapies for acute diarrhoea in children. Int J Pediatr 2013;2013:1–14. Limited Abbot Health Products. SPC, Hidrasec Infant 10mg granules for oral suspension. 2014. (Updated 9 April 2014) https://www.medicines.org.uk/emc/medicine/27109/SPC/Hidrasec+Infant+10mg+granules+for+oral+suspension/#PHARMACOKINETIC_PROPS (accessed 25 May 2014).
. Pre- and post-marketing safety profiles of racecadotril sachets, a “new” antidiarrhoeal drug. J Pediatr Gastroenterol Nutr 2009;48(Suppl 3):E99–E100. Group BMJ. BNF for children: the Royal Pharmaceutical Society of Great Britain, and RCPCH Publications Ltd, 2013. World Health Organization DoCaAHaD. The treatment of diarrhoea, a manual for physicians and other senior health workers—4th rev. Geneva: World Health Organization, Department of Child and Adolescent Health and Development, Development DoCaAHa, 2005.
. Vesikari Clinical Severity Scoring System Manual. PATH, 2011 2nd May 2011. Report No. : Version 1.3. Regulatory Support Center (RSC) OfPiCROO, of the Division of Allergy and Infectious Diseases (DAIDS). Division of Allergy and Infectious Diseases table for grading the severity of adult and pediatric adverse events. Regulatory support center (RSC), Medical Research Council, (DAIDS) DoAaID, 2004. clarification 2009 version 1.0.
. Racecadotril—a novel drug for treatment of acute watery diarrhea in Indian children. Karnataka Pedicon 2005; Karnataka, India: Pediatric on call. 2005. (Updated 1 Jan 2006). http://www.pediatriconcall.com/fordoctor/Conference_abstracts/racecadotrial.asp (accessed 20 Sep 2013).
. Short term clinical outcome of children with rotavirus infection at Kenyatta National Hospital Nairobi. East Afr Med J 2010;87:242–7. Contributors JG (primary investigator for the study) took part in design, execution, analysis and presentation of the study results. AL (content expert) and FW (statistics expert) took part in design and analysis of the study with input on manuscript preparation and presentation of results. Funding Aga Khan University, Nairobi; Sai Pharmaceutical Distributors, Nairobi, Kenya. Ethics approval Ethics Review Board of the Aga Khan University Hospital, Nairobi, and Scientific and Ethics Committee of the Kenyatta National Hospital/University of Nairobi.